ust" to go to, simply because it's one of a kind. In fact, my last trip with Aileen was in General Santos City, but since it was close to Davao, we just had to fly in to Davao one day earlier for Lachi's and travel by land to Gensan the next day. That's how much we love Lachi's. 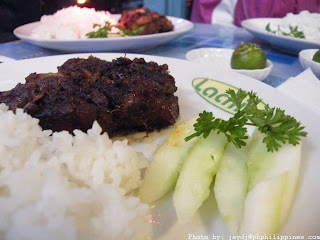 Some of us bloggers in the Davao Food Appreciation Tour were so excited that Lachi's was next on our list of restaurants to visit for dinner, that we excused ourselves from the afternoon tour of Davao just to get a headstart on Lachi's. Our sneaky plan was almost full-proof as we even instructed the staff of Lachi's not to mention in the evening that we were there earlier. Unfortunately, their staff is very loyal to Mike, one of the owners of Lachi's and all the bloggers found it was our 2nd time around that day to eat there. Nevertheless, we didn't hide in shame, cause one visit to Lachi's is not enough for anyone who appreciates the taste of their food. In fact, I quote Aileen saying that "I could eat at Lachi's everyday". More than half of the restaurant was reserved for the bloggers that night which made us feel very special. We were also excited to have some fellow bloggers try out Lachi's for the first time. I remembered my first experience and ever since, it became one of the driving points to come back and visit Davao. We were treated to Cream Dory in Thai Sauce, Breaded Tofu in Teriyaki Sauce, Laing Pasta, Pork Belly in red Bean Curd Sauce, the ever-delightful Pork Marinara and the unforgettable Pork Ribs. I'm not a fan of Laing, but the other bloggers said that it's was very tasty. I got the pork ribs which is so tender that you don't need a knife to cut it to pieces. Their Pork Marinara is also a best seller. It makes me wonder why I don't see this dish anywhere else. There were also new dishes on the menu that I hadn't seen before:Pinoy na Pinoy Pasta which is described as spaghetti with laing sauce and sprinkled with parmesan cheese and topped with pan-fried bangus, and their own Arroz a la Cubana - sautueed lean ground beef and raisins, alongside fried bananas and rice topped with fried egg. I made it a point to save some stomach space for their ever-scrumptuous and delicious cakes. But before that, we got a rare opportunity to sample some desserts which they only offer with their catering services. They had Ube Panna Cotta served in a small shot glass and Creme Brule caramelized in a big white soup spoon. The presentation was colorful and placing them all together made it even more attractive (and exciting to immediately grab one the moment everybody was finished taking pictures of it). Our last round of delights arrived: the famous Lachi's cakes ! We were treated to slices of cakes from the Lachi's refrigerator which we can light candles in front of and devote ourselves to it as if it were a shrine. What cakes do they have ? A whole lot ! Here's a list of cakes to make your mouth water: Midnight Delight, Cashew Mocha Torte, Roasted Walnut Choco Supreme, Luscious Mud Pie, Premium Dark Choco Cake, Yummy Choco Pie, Black & White Bar, Old French Chocolate Cake, Carrot-Walnut Muffins, 5-Choco Torte, New York Style Cheesecake, Sour Cream Cheesecake, Choco-Vanilla Cheesecake, Dulce de Leche Cheesecake, Carrot-Walnut Cake, Durian Cheesecake and Macadamia White Choco Bar. 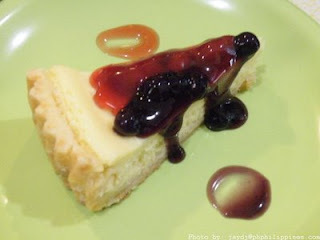 I'm a big fan of cheesecakes and I just had to get my fix in the form of blueberry cheesecakes and sourcream cheesecakes. 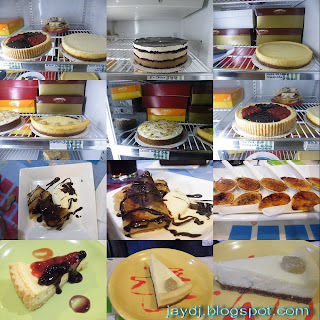 The great thing about Lachi's cakes are that they are not too sweet. It's just the right amount of sweetness without making your eyes squint from a sugar rush. They're not too cold neither nor too melted. That's what makes Lachi's cakes perfect. Aileen noted that her favorite sansrival is perfect too by noting that your fork should be able to go through the entire slice and not get stuck in the middle, pointing out that sanrival shouldn't have hardened interiors nor be chew challenged. Our Lachi's dinner was a success with the bloggers. Everybody was still talking about all the foods and how delicious it is even after our Lachi's visit. That's how memorable it was. And reliving all the foods through this post made me hungry and craving for it. "To blog about it is human, to actually taste it is divine." You forgot to mention that we came back for more the next day hahaha! 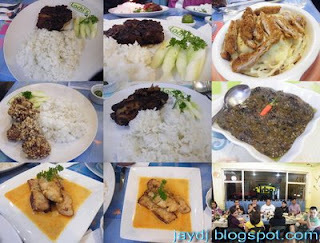 Lachi's *defined* all what's good in Davao cuisine. I'm glad you guys got to experience it during DFAT. wow, this post is making me hungry (you described the food so well)... I'll definitely include Lachi's should I visit Davao. How Heavy Is Your Luggage ?